Winter came sudden and succinct to the valley, after a long and lulling autumn. Where do I begin? The crisp, low, golden light heaving itself over the snowy mountaintops? The squeak and crunch of light snow on the driveway? The curious and guilty sensation of bathing in woodfire heat, while outside the horses eyelashes and whiskers freeze into tiny icicles? The way dry, frozen logs jump apart with a satisfying crack when you surprise them with the swing of your axe? The new appreciation for 5 gallon buckets when the outside hose and faucet freeze? Or maybe I’ll begin at the boundary between life and death, which grows thinner and thinner as the world sinks deeper and deeper into sleep around us. Like the rest of British Columbia, we’re having a cold snap. 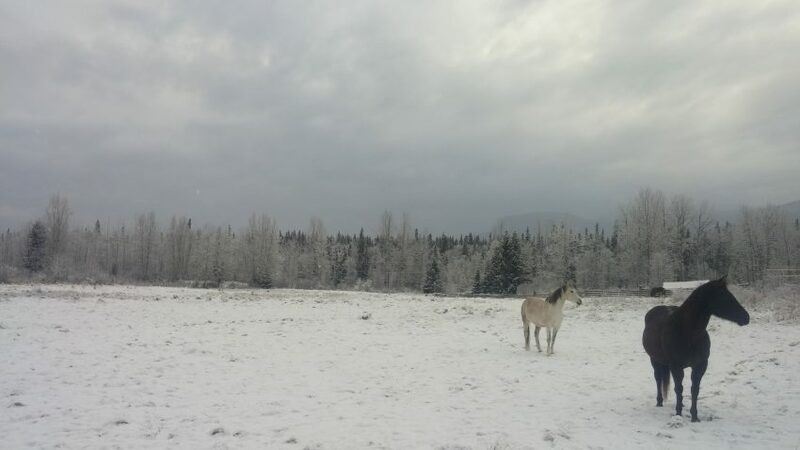 For us in the North West, that means -20 to -30 degrees Celsius, where your nose hairs freeze on the in-breath and stick your nostrils together, and your face hurts, and the car won’t start, and the horses have poo frozen solid into their hooves, and the chickens huddle miserably under the heat lamp cursing your cheerful ministering. There is both the calm understanding that deep cold is something very normal that countless beings survive each and every year, and the quiet churn of something like alarm (sometimes exhilaration) that surviving requires attending to, and that a missed step can erase that boundary one moment to another. I could just as easily call this piece, Chop Water, Carry Wood, because the water freezes so hard some nights that only an axe will punch through, and the two wood stoves require armloads, boxloads, truckloads of wood to be moved, cut, stacked, burned, repeat. It’s new to me, coming from a temperate climate to here, and it’s interesting to watch my assumptions, ideals, and dreams change shape as they merge with reality. “Chop wood, carry water” used to be an adage to me, a poetic way of referring to the work we all must do in our lives, even when it’s mundane or inefficient or repetitive. Now, I don’t chop wood and carry water to be good, or to be dutiful, or to be humble, or as part of a pastoral scene – I chop and carry because if I forget, the cold will make short work of us all. It’s not, as it turns out, particularly romantic. But how could I have known until I’d lived it? Change is an untameable beast. As this year creeps towards the close I am looking back at the wild time we earthlings have been through. In a short 12 moon cycles we’ve all, undoubtedly, been through significant shift, turmoil, loss and regrowth. Those of us lucky to be living outside of war and protest and disaster zones are still feeling the universal theme of destruction and creation reverberating through our cells. No one is untouched. Grief and uncertainty weave together with possibility and delight. We stand on the brink that we prayed for and feared equally. In the space of a year, I have come from a small southern island to a big, frozen north. From boarding my horses at the umpteenth uncertain location to holding the deed to oodles of land still dizzyingly unexplored. From ending a nearly nine year relationship with one man to diving headfirst into something fresh with another. From the slow foggy depression of concussion-recovery (I hit my head last year and am still unraveling the lessons of that) to a new sense of grounded empowerment. From working in a grocery store to working for an innovative, inspiring non-profit. From living independently to living in family and community. We have a new dog, a new horse, a new truck, two new goats (hopefully newly pregnant) and of 16 new chickens, 14 that remain. New fences, new boots, new routines, new priorities. None of these seem dispensable; each and every new thing is dear to me. They have cost a lot, in time, energy and money. Much of this has required leaps of faith and big losses. Very little of it has been specifically happy, calm, or stable. I remind myself daily to relax into the warmth and love of my home and the staggering beauty of the full moon. 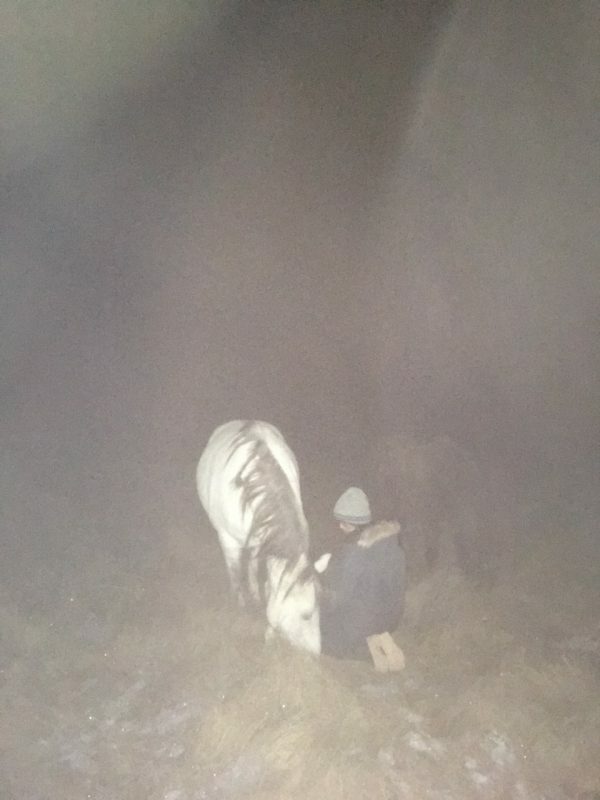 I feel the horses calling on clear nights, when Spero dances my strange, spontaneous dances with me and then lets me kneel in front of him and bury my face in the impossibly thick pelt of his chest while the other three graze in clouds of frozen steam all around. I watch my mother delight in her new yearling, an awkward little feral Quarter Horse who had been through more than his share of life already. She calls him Falcon and he comes to his name. He lets her touch his neck. He doesn’t like carrots but nibbles them politely anyway. She wants nothing from him and thinks he is beautiful, and so he is. The world around us is shocking and gorgeous. And so with no real conclusion to come to, I’d like to pass on winter’s blessings to you all. May you simplify, receive, and let go. May you know what is important and what cannot be done at this time. May you embrace the entirety of it all, or at least try to. May the wild that calls to you be gentle and generous as much as it is fierce. And may your wood-chopping and water-carrying, whatever that might be, get you through the hard times and keep you hale and hearty for the good times. Oh Kesia, that one was beautiful, and such a perfect un-ending to a deeply felt year- for all of us, from every pole and paradox of emotion. “May the wild that calls to you be gentle and generous as much as it is fierce” May there be a softness of flesh among all of these bones picked clean by what we know. This morning as I was deep in the heart of my own water carrying (getting ready for the day’s sessions and two days of an open-farm holiday event over the weekend) I paused to watch 5 eagles soaring the updrafts of the sun’s warmth as it pierced the cold. Ravens called but far under them. Up there in the light they were untouchable. A monument. And even then- as the young man got out of the car and began to shout- angry, full stop “SHUT UPs!” and curses- even as the session I had in my mind fell apart and I followed him into the next moment, and the next, and the next- until he was up on Dublin, knocking snowballs off fence posts with a plastic chicken on a stick and laughing- even then, I could still feel the medicine of the eagle’s spiralled flight working within me. The certainty of wings held perfectly motionless in nothing but air. That we will be carried by the next moment, and the next and the next one too. Oh you wordsmith, Kera! Your river is a damn fine one for eagles; they’re more spread out here, less constant. God, Dublin, what a saint! Rubber chicken snow-bopping…hilarious. Here’s to going with it, whatever it may be. Merry Christmas and all that, dear one! Oh Kesia…you also are such a wordsmith. Your posts are like a glimps into my romantic fantasies. Love how you show that there is the hard & tuff side too. You know the saying “only the strong survive” which can refer to mental & physical strength. Your phrase ” change is an untamable beast” is my favorite. Please keep em coming…as we ride on the coat tails of your wilding????❄️☃??? Michelle, you fill my heart up!! Also I hadn’t realized until now that you could use emoticons in comments. This changes everything…???? Kesia, this piece is a magnificent, clear eye emerigng from the storm that was 2016. You help me clear my vision. It’s been blurred by the implications of the political moment we’re in. You also embedded a perfectly-sized cautionary note: changing times require us to focus, pay attention. We’re called to modify our responses to the moment, when the content of those moments change. And yes, they’ve changed dramatically for us all, with more to come. I find it interesting that your spirit called you northward. Last spring and summer, mine did too, in a big way. Life had other ideas. But that gut whisper persists: “Get thyself north to the snow. Hide!” I couldn’t make it out at the time. I wondered if was becoming paranoid and even made an appointment with a colleague to check. He didn’t know where it was coming from, but assured me that I hadn’t slipped into the realms of psychosis. Eventually, I decided that those thoughts arose to give me an opportunity to overcome a life-long phobia of snow. Yea, I broke my back on a Vermont ski slope when I was five. Folks didn’t realize that I was that broken, so my Dad carried me down to the lodge, which was a long distance! It hurt. My brain decided that all that misery must be snow’s fault. The minute I could, I moved to coastal California and have stayed here. Maybe twice a year, there’s a little icing in the backyard. This morning was one of those frosty dawns. The cats woke me early to rekindle the woodstove. I read your post with a steaming bowl of boiled fruits, beans and rice while sitting next to the woodstove with a purring cat draped across my lap. In this moment, life is sweet, secure, warm and full of pure critter love. Thank you, Life. Your writing, your soul that shines through it helps me to acknowledge the stark reality of our human developmental stages. As I round the bend to elderhood, I don’t have the resilience to fling myself into that stark of a change. I will have to trim my sails and ride out the storms to come within a smaller range of options, at least in terms of extreme climates and phsysical hardships. While reading your post, my knee-jerk reaction was, ‘Poo, I’m too old to survive that!’ It transformed as soon as I acknowledged it. It’s next rendition was, ‘Well, I may be too old to deal with persistent subzero teperatures, but I’ve sure put together an impressive data base of knowledge and the skills to use it over the course of these decades. That’s the toolbox I need to look to. Phew, I needed that reminder. Last weekend, a newly wed young couple came by to discuss plans for the future. They rent a portion of my home as their urban escape. They said that they planned to run. Where, I asked. They didn’t know exactly where, but Dan said it would be somewhere north. He was putting together a team to do gorrilla grows in the Pacific Northwest. They invited me to come. Initially, the plan excited me. Yes! I need a family to belong to, a team to support. Sure. Then, I thought about it and laughed so hard that snot poured out of my face. Thirty years ago, sure. Now, no way. I’ll need to put together a team right here, now. Hmn, that’s a different sort of challenge. The Crone’s developmental task is to hone her experience into vital skill sets for whatever is rounding the next bend. We must hone an axe and knit a shawl out of what we know to survive. It sounds like you have what you need, Kesia. The whit, knowledge, physical stength and spiritual trust to endure. You will attract what you need when you need it, because you know how to cast your attention and listen to Life when she whispers her directions through encrypted coding. You inspire us to do likewise. Thank you! We humans need that now. We’re desperate for models of integrity, authenticity. This is exactly what the horses have instilled in us. They have prepared us to be the humans that are needed now. You can’t ask for better preparation for hard times than that! Well, maybe we could. We humans need communities of other humans to support ourselves to be the best we can be. And, here we are! Precisely, here we are! I was raised to not just appreciate but to truly crave intergenerational/many-aged company. We all need each other and our different stages, gifts, wisdom, and insights, and I think communities suffer for lack of elders or young’uns. Your accumulated wisdom and knowhow is a rich addition here! As much as we learn to be resilent and independent here, we have had to learn to rely on neighbours and community. There is a strong sense of cooperative and common-sense cyclical cashless economics here, in this valley of draft dodgers, pioneers, back to the landers and first nations…learning to recieve so much help and good will in our first year has been its own journey. However I completely love the way you’ve found your way through those callings. It’s not always literal. And a good life, or a life of intrugue and deep learning, at least, can be found just about anywhere we land. The wild never left these places. It’s just waiting for us to call it in. I am filled with remembering of my friends the Divine Miss M and her trusty sidekick (or is she the sidekick? I think she does that). Actually when I read this, my goosies indicated a message from beyond the earthly realm. We can share, hopefully over a glass of wine when you visit our cold, snowy coast soon. Be well my soul sister! Wine and woo-woo talk, it’s a date!! Miss Molly is doing well here despite the foul temperature; she’s chubby(! ), fuzzy, and just as opinionated as ever. Can’t wait to reconnect! So happy to have you, Stephanie! Merry Christmas! Thanks for inviting me to this blog. Beautiful writing. Kesia, so lovely! I felt I was living it again, as it’s only this past year…and moving into this one, that I haven’t lived where so much of life is about the basics you describe. For me (as you know) suburbia is far more extreme and difficult. Thank you for reminding me what there is to live for. My absolute pleasure, Diedre. Suburbia is temporary. Wildness persists. I can’t wait to see what comes next for you…! 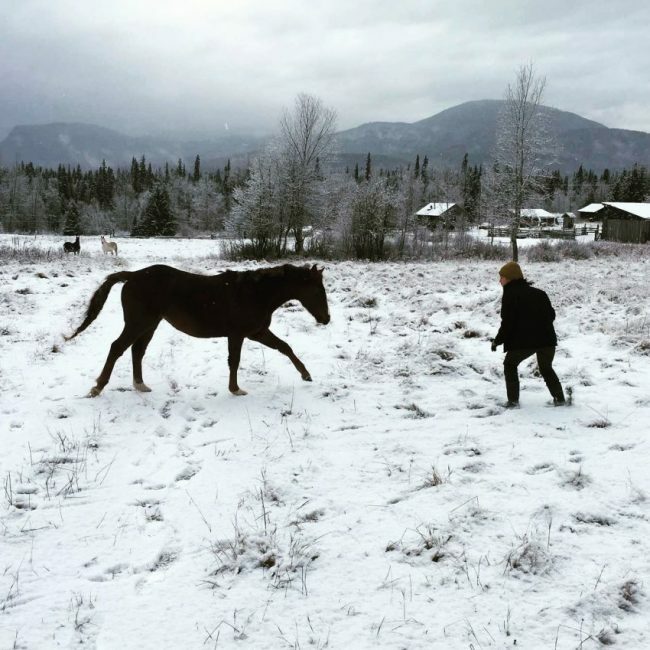 Yes all is true on what you say, also the 4 legged can and will teach us 2 legged so much if we would just listen and observe….I am new at horses being that I rescued 3 this last year and 2 the years before….. Watching and observing and understanding partnership and companionship along with trust and calmness has improve me with them and creation… each one has it own abuse issues to work out and the awesome responsibility involved is so rewarding…. look forward to your blogs ( all new to me) and songs… Shalom and prosperity in all your activities…. Wow Kenneth, what a huge jump into horse world you’ve taken! I love your approach and your awareness – those are some fortunate horses to have such a willing human. Peace and best wishes to you and your 2 and 4 legged friends and family! Upload a picture of your crew if you can Kenneth – would love to see them!